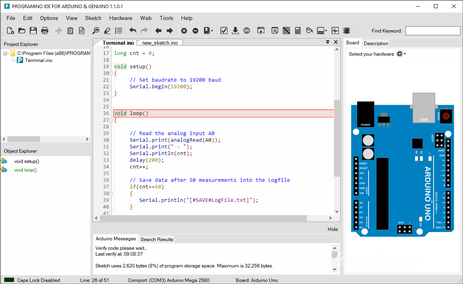 is an alternative easy-to-use IDE for Arduino, Genuino and compatible microcontroller boards. Programino IDE for Arduino is made for “Maker” and “Professionals”. The easy-to-use editor, the various available tools and the HTML5-Editor for Arduino IoT applications make it easy to program your project idea quickly. #Home, #Save, #Clear – commands to control the terminal similar as a VT100 terminal.